As the social media tidal wave has flooded in, many marketing organizations have stayed firmly in their comfort zone, treating social media as just a new channel to launch content at people. But social media brings more profound changes. Marketing has always been about trying to create interesting content. In the 1960s, advertising guru Howard Gossage observed “People read what they are interested in… sometimes it’s an ad”. This essential truth is now firmly back on the agenda, because it’s the foundation of what is now known as “content” or “pull” marketing. Marketing organizations everywhere have jumped on the content marketing bandwagon, and are churning out more materials than ever, helped by the fact that it now effectively costs nothing to get messages out to the market, via web pages, blog posts, Twitter, or Facebook. But trying to be interesting and actually succeeding are two very different things. It’s easier than ever to “make noise” — but because everybody else in the market is making noise, it’s harder than ever to get listened to. The vast majority of today’s marketing materials are professionally-produced, designed for a specific audience, and talk about customer concerns and problems. But that doesn’t mean that they are actually engaging or differentiating. In the past, the relationship between between good content and effectiveness was linear: the more interesting your marketing, the higher the impact — but no longer. Because of the sheer volume of material available, average marketing content now quickly disappears into a vast sea of “marketing mush” without making any impact. On the other hand interesting content is more valuable than ever. Content that is good enough to share can now reach a vastly larger audience via email, search, retweets, and Facebook likes. 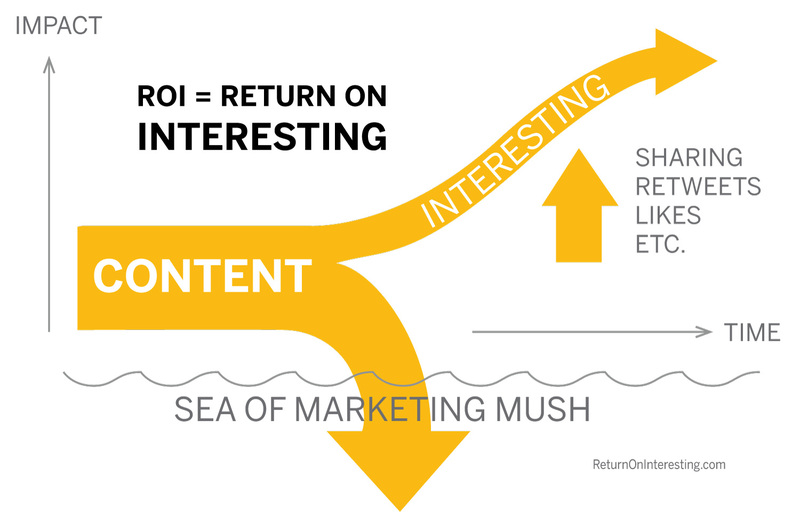 In other words, the “return on interesting” has soared because of the new social environment. Thankfully, social media has also enabled organizations to create more interesting content, through better listening and analysis. But taking advantage of this requires a rethink of traditional marketing campaigns and methods, and many organizations are struggling to make the change — or indeed struggling to realize that they need to change. If you’d like to hear more, subscribe to the blog, or follow @ROInteresting on Twitter.